The Reichsarbeitsdienst (or RAD, Reich Labor Service) was an organization set up in Nazi Germany in an effort to combat unemployment. It was initially similar to the Civilian Conservation Corps of the United States, initiated by President Roosevelt, to help the country recover from the Great Depression. During World War II, the RAD was an auxiliary force which provided support for the Wehrmacht (Army). 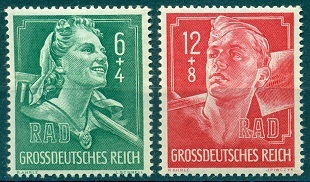 The set of stamps in the image above was issued in 1944 to celebrate the 10th anniversary of the RAD. The RAD was formed in July 1934 as an official state labor service. It was created from an amalgamation of the many labor unions formed in Germany during the Weimar Republic. RAD members provided service for various civic, military, and agricultural construction projects. Konstantin Hierl was its leader throughout the organization's lifetime. The Reichsarbeitsdienst was divided into 40 districts, each called an Arbeitsgau. Each of these districts was headed by an officer with headquarters staff and a Guard Company. Within each district were between six and eight Arbeitsgruppen, or Workers Groups, battalion-sized formations of 1200-1800 workers. These groups were finally divided into six company-sized units. Each rank and file RAD man was supplied with a spade and a bicycle. The RAD symbol, an arm badge in the shape of a downward pointing shovel blade, was displayed on the upper left shoulder of all uniforms. Throughout the course of World War II, the RAD was involved in many military projects. The RAD units constructed coastal fortifications, laid minefields, manned fortifications, and even helped guard vital locations. The role of the RAD was not limited to purely combat support roles. Several RAD units saw ground combat on the eastern front, and as the German defenses crumbled, more and more RAD members were committed to combat roles. 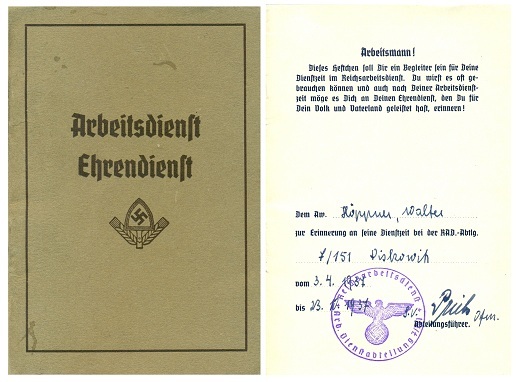 The image above shows the cover and first page of a Reichsarbeitsdienst membership booklet. This particular member enlisted in the RAD on April 3, 1937, for a period of six months. The remaining pages of the booklet contain photographs of Der Führer and Reichs Chancellor, Adolph Hitler; Reichsarbeitsführer Konstantin Hierl; and Generalarbeitsführer von Alten, leader of the Arbeitsgaues XV - Saxony, along with workers slogans by each of them. 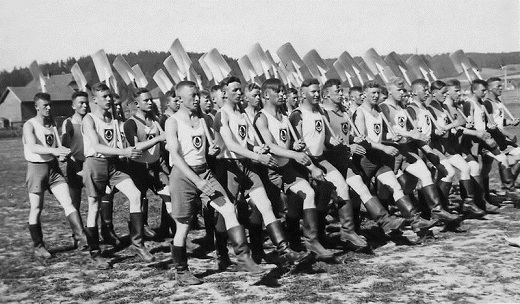 Following a six month enlistment in the RAD, members were allowed to join the Wehrmacht, if they wished to.